The 2018 midterms are less than a month away but already the posturing to run for president in 2020 is in full force. Nothing illustrates this more than Massachusetts Sen. Elizabeth Warren's bizarre decision to release a DNA test to prove her family's Native American ancestry. 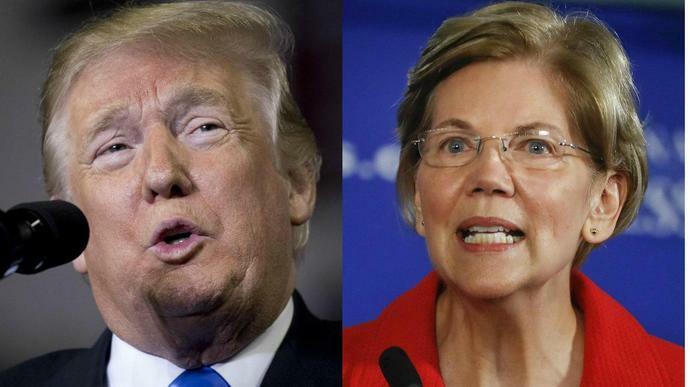 In her effort to pre-empt Donald Trump's familiar refrain of "Pocahontas," Warren only revealed that she is not up to the task of beating him. If the 2020 presidential campaign comes down to a name-calling contest, Trump will easily win re-election. During the 2016 campaign, Trump successfully annihilated the Republican primary field using nicknames like "Low energy Jeb," "Lyin' Ted" and "Little Marco" as his favorite weapon of choice. Once Trump saw how successful his elementary school-style attacks were against the GOP, he deployed it against every perceived opponent from "Crooked Hillary" to the "Failing New York Times." Overshadowed by the spectacle of a DNA test was the compelling personal family narrative about the senator's parents' love story. Warren's perspective on her heritage was shaped through her mother and father's decision to elope because her "daddy's parents" "were bitterly opposed to their marrying because of my mother's family ... was part Native American." It's the stuff out of family lore that no child would ever question. If anything, it's endearing. Where things go south, however, is the unnecessary use of a DNA test ― something you usually see employed when dealing with the paternity of illegitimate children on a daytime soap opera. The DNA test revealed that her Native American ancestry is as small as 1/1,024. And the stunt provoked the Cherokee Nation to release a blistering statement pointing out that "a DNA test is useless to determine tribal citizenship" and that "using a DNA test to lay claim to any connection to the Cherokee Nation or any tribal nation, even vaguely, is inappropriate and wrong … Senator Warren is undermining tribal interests with her continued claims of tribal heritage." Other Native American writers have similarly objected to the methodology and implicit message behind Warren's announcement. Warren's misguided efforts to definitively address the controversy have now severely backfired. Her ambition has driven her to make an unforced error that is only exacerbated by its timing. In a moment when the entire focus of the Democratic Party should be on winning the midterm elections, why make a spectacle of yourself and your family right now? Why not wait until after the midterm elections? Is waiting three weeks really going to make that much of a difference? By acting in haste, Warren has both provided her opponents and detractors with fresh ammunition to use against her and potentially hurt her party's chances to retake one or both chambers of Congress. Every minute Warren and company spend responding to "Pocahontas" is a minute they aren't talking about those scandals. Make no mistake about it, Democrats running against Trump need to be prepared for a vicious onslaught of insults, lies and attacks. The thing is that, like all bullies, Trump is massively insecure. It's in these insecurities that Democrats can neutralize his schoolyard tactics and effectively fight back. But the Elizabeth Warrens of the world can't hope to win this fight if they let Trump dictate the terms of their own life story.